Campfires is a part of camping if you ask us! There is something calming about looking into a campfire at night, and getting warm after a long day in the great outdoors. Building a fire is easy once you know the steps of it. How do you build a good fire? Collect enough tinder to fill your hands. Tinder should be no thicker than a pencil – the smaller the better. 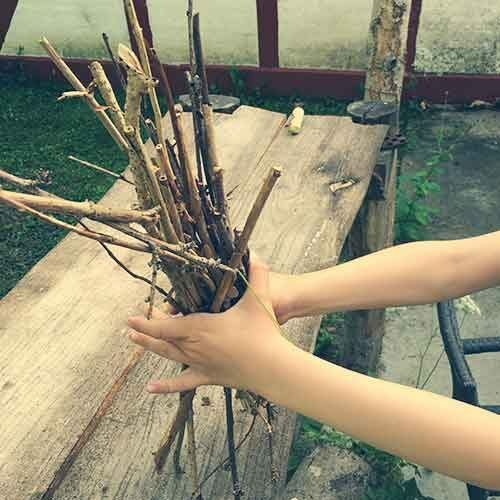 Collect enough kindling to fill your arms. 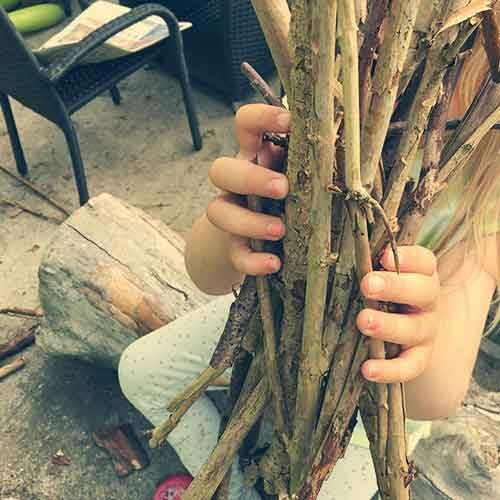 Kindling should be as thick as your fingers. Collect some “Fuel”. Big pieces of wood that are as thick as your arm. Take some paper and roll it loosely into a ball. Create a “tipi” around the paper with all of the tinder. Stack a few of the “fuel” pieces of wood around the kindling. Light the paper with a match. WARNING: Only ever create a campfire in locations approved by the campsite owner. 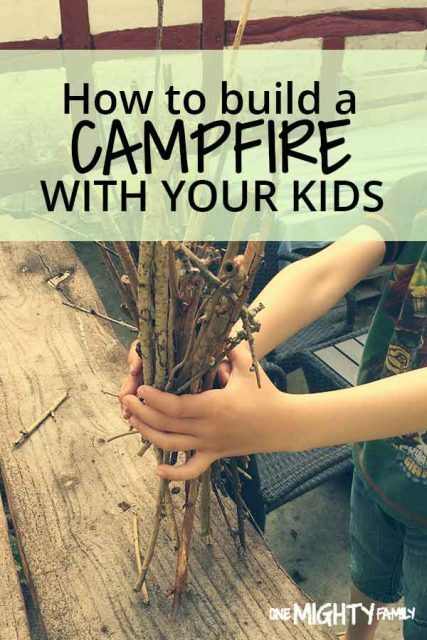 One Might Family is not responsible for your campfire – you must know the rules that apply if you choose to light a fire. Lets look into how to make a campfire a bit more. 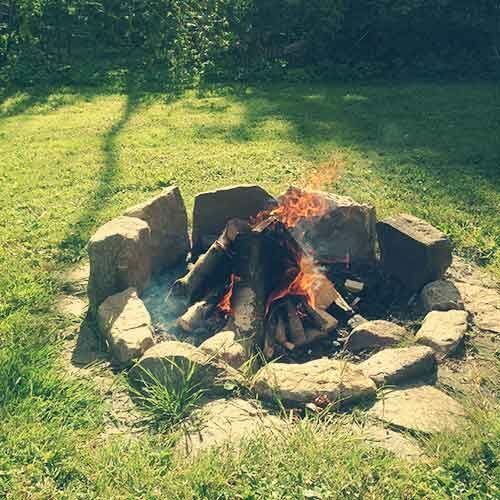 I have tried to explain all the steps needed to build a good campfire and I hope that this will give you a good campfire. Please send us a picture of your campfire once you’ve done it, or tag us at @onemightyfamily on social media. I told my kids they need to fill their hands with tinder. This needs to be very dry, about the size of a pencil lead. – ours was a little thick but we made it work :-). This will be the very middle of your fire, where you need your match to start fire. If the tinder you find are longer than from little finger to thumb go ahead and break them in two, that’s what we did. You place this into the firepit as the base of your campfire. Make sure you stack it like a tepee, you can place some newspaper underneath if you want. That makes it easier to start your fire. Once they have the tinder, they need to start looking for kindling. This should be about as thick as a thumb, and as long as their arm from fingertips to their elbow. They should have enough kindling to fill their arms completely. We did several trips. This goes on top of the tinder in the tepee. Building from the middle and out in what will become the campfire. Now comes the fuel. These are logs about the size of your wrist and as long as your arm. You can wait to add these until you have the tinder and the kindling going. Now as i see it, the only thing left is making those smurfs – or your favorite campfire food. When will you be building your next campfire? ?